FFE, a leading specialist in fire detection, is working with Bloodhound SSC, the team behind a car capable of over 1000mph, to develop a bespoke Talentum flame detector to protect the pilot while it attempts to break the Land Speed record next year in South Africa. FFE has brainstormed ideas and developed the specialist, ultrafast Talentum flame detector over the past six months. The detector, comprised of a robust, glass-fibre reinforced synthetic material, is to be completed by the end of this month in time for the runway trials later this year. To learn more about this exciting, globe-spanning project please visit us on stand H160. 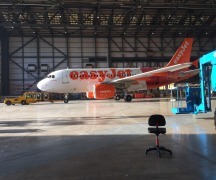 To protect workers during aircraft spray-painting, Cambridge International Airport have installed nine Talentum flame detectors and one Fireray beam detector from FFE. The Fireray One is a standalone beam detector that prioritises ease of installation. Its One Minute Auto-Alignment with integrated user interface allows you to steer the laser onto the Reflector, then at the flick of a switch, it aligns itself. 8 times faster than previous detectors. Watch this video and discover how quick and easy it is to align a beam smoke detector. FOR MORE INFORMATION CONTACT FFE LTD.